Ok so you KNOW this stuff is gonna be good. Know how you can know? Let me just repeat the title for you: cream cheese. stuffed. chicken. wrapped. in bacon….C’mon now your taste buds don’t stand a chance! This is just too much deliciousness. Game over. This mouth-watering meal only calls for 4 ingredients so it’s also budget friendly. One thing I really like about this dish is that the bacon is actually crispy! Most times when I bake a dish in the oven with bacon in it, the bacon doesn’t crisp up. With this recipe, after baking, you broil it for a few minutes so you get that delicious crispness. Slice each breast in half lengthwise so that each is about 1/2 inch thick. 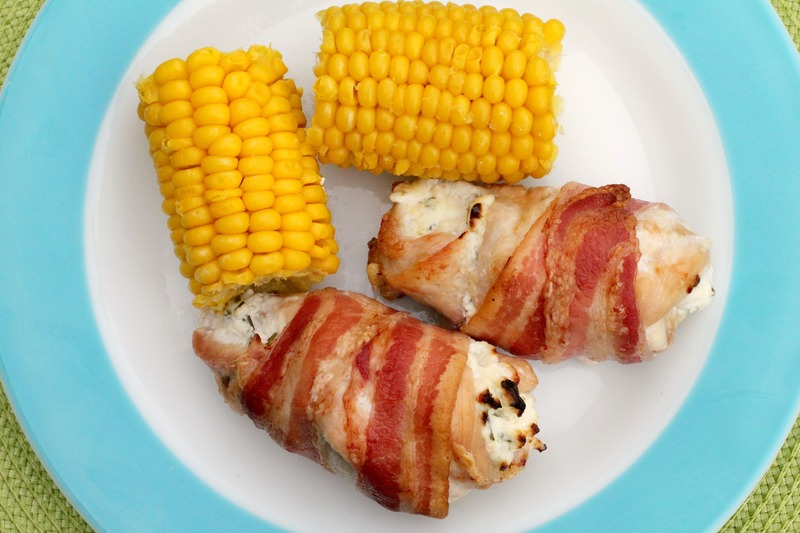 Spread about 3 tablespoons of cream cheese over each chicken breast. Then season with salt. 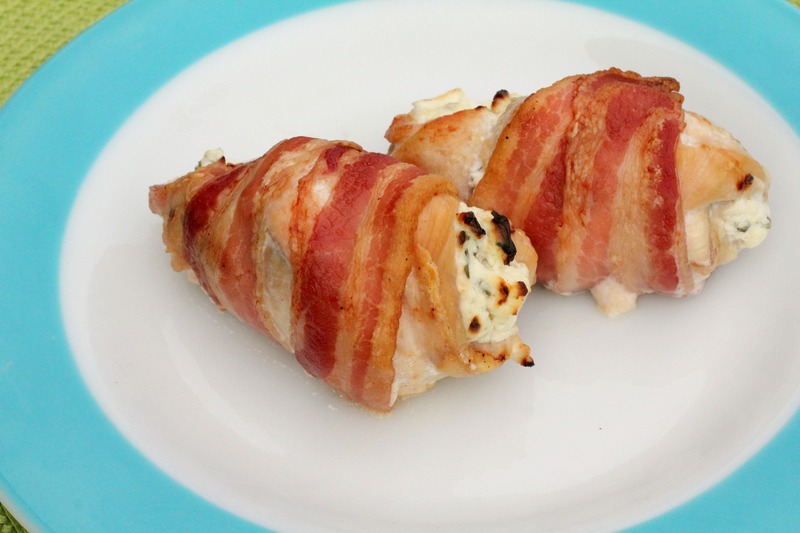 Roll up and wrap with a slice of bacon. If necessary, stick a toothpick through to hold it together. Bake uncovered for 35-40 minutes (or until juices run clear). Turn on the broiler and broil six inches from the heat for 5 minutes or until the bacon is crispy. Thank you! It’s so simple yet so delicious! That looks so amazing! For the grill, maybe try sitting them on a piece of aluminum foil…then you could fit it to that size. That’s what I was thinking I guess I’ll just have to try it out and see how well it works I’m a little afraid of losing too much of the cream cheese in the middle if it just oozes out, but we’ll see! If you do it on the grill, how about on top of some foil? You’ll get the smokey goodness of the grill without the mess. That’s what I’m thinking of trying I just hope that my cheese doesn’t all ooze out and that my bacon still gets crispy! I guess the only way to know is to experiment. Pre- cook the bacon until almost done then wrap the chicken. The bacon will finish cooking ! I do this with anything I wrap in bacon . Ooo that’s a good idea! Thanks! Your welcome ! I just want to Thank you for your recipes. About time we have a down to earth person like you .